The Center for Web Research of the Computer Science Department of the University of Chile, under the sponsorship of the International World Wide Web Conference Committee (IW3C2) and the Chilean Computer Science Society (SCCC) cordially invite you to participate in the First Latin American Web Congress on November 10-12, 2003, in Santiago, Chile. International researchers, technologists, and leaders from academia, industry, and government will gather at LA-WEB to present, demonstrate, and discuss the latest developments of the Web and how they can be used to empower the Latin American Web. The technical programme will include refereed paper presentations, alternate track presentations (see below), plenary sessions, panels, and poster sessions. Tutorials will precede the main program. Proceedings were published by IEEE CS Press. You can download the Table of Contents here (PDF, 300kb). 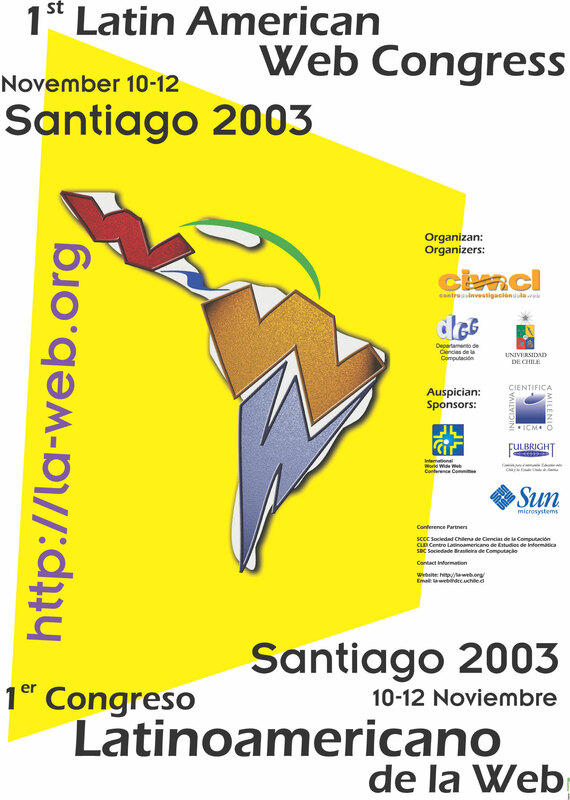 During the past years, Chile has been the most stable growing economy in the region, and is one of the regional leaders in information technology and telecommunications. Santiago, with more than 5 million inhabitants, is not only the capital of Chile, but also its financial and administrative heart. The city was founded in 1541 and is located at the foot of the Andes Mountains and only one hour away from the Pacific Ocean, thus being the ideal point to start tours to the north (desert), south (lakes and glaciers) or west (Easter island). Due to Santiago's much influenced past it displays a wide range of architecture, contrasting classical European style buildings with modern attractive commercial centers. Along with its cultural influences, Santiago is a cosmopolitan city where visitors can enjoy cultural activities, and a great variety of international, ethnic and local gastronomy, accompanied by the most delicious Chilean wines. Santiago is easily reachable by air from Asia, Europe or North America.